This is not the 1960s, but it’s difficult to convince many female employees who function within outdated corporate Human Resources policies. The policies read like a military manifesto by describing rigid schedules and failing to mention recognition and reward systems or establishing promotion policies favoring men. The HR policies form the unforgiving backbone of an organizational culture that disengages the modern woman, even as the organization struggles to understand why it cannot meet gender diversity workforce goals, has difficulty with recruiting and hiring talented and skilled women and is challenged with low female employee retention rates. Gallup data found that 48 percent of female employees say they are actively looking for a different job or watching for new opportunities. Though 73.5 million women over the age of 16 are working, they’re often caught between two opposing worlds. In one, she’s viewed as capable of career success and managing work and family. In the other, she’s criticized for denying her children a full-time mother to pursue a career. For the majority of women, it’s children who have the most influence, so the ability to achieve work-life balance is a major determinant of happiness. As a business leader, you are challenged with finding ways to make the workplace engaging to female employees by developing an inclusive culture, implementing HR best practices and recognizing and addressing issues of importance. Following is a list of what female employees desire in the workplace to find happiness. The workplace culture influences gender diversity because it impacts talent management practices, interactions with co-workers and managers and career opportunities. A positive culture encourages employees to assist each other and to treat each other with integrity. It emphasizes the meaningfulness of work. For female employees, all the characteristics of a positive workplace culture inspire what they want – respect, compassion and positive relationships. Talented women need a voice in the workplace because they’re still overcoming biases holding them back from advancing. Traditionally, men worked their way up the corporate ladder to assume senior leadership positions. Historically, women were not hired for higher-paying jobs and are still not fully included in succession planning and career planning, keeping them out of the loop for promotions into leadership positions. Mentoring experienced and newly hired women gives them organizational visibility and access to decision-makers. A Global Strategy Group study sponsored by The Rockefeller Foundation found that only 34 percent of the women surveyed believed their workplace put a high priority on having women in leadership positions. A lack of support from mentors for career advancement and lack of access to career-building personal connections keep women from advancing. Properly structured work benefits and perks are important to engaging all employees. Raising the profile of talented women in your organization through a strong recognition and reward system is a success strategy. Implementing a rewards and recognition program enables your co-workers and managers to recognize exceptional effort, innovative ideas, team contributions and leadership. A Fairygodboss survey of women attending the World Economic Forum in Davos, Switzerland found a correlation between the number of weeks of maternity leave allowed and job satisfaction. Employer policies supporting work-life balance are important to women. Your policies can embrace supportive maternity leave and a flexible hours work schedule or a home-office work schedule, for example. Since children have the most influence on whether women work, the ability to balance work and family responsibilities is extremely important. When a child has a doctor’s appointment or is on school break, savvy employers allow women scheduling flexibility. Flexible work schedules take many forms, from a set number of hours worked from home to the full ability to determine when and where hours are worked. Unconscious bias, embedded in workplace cultural norms, expresses itself in many ways. It limits women’s access to important projects, thus harming their advancement opportunities. It’s expressed during recruitment or performance reviews when men are consistently rated higher than women. It’s found when men are primarily chosen for prime training and development opportunities or promotions. Women want unconscious bias addressed in all its subtlety. Statistics say the pay gap persists, with women earning approximately 77 percent of what men earn (figures vary depending on the source). There are a lot of reasons for the gap. In a study reported in the Journal of Applied Psychology, men who act altruistically, such as staying late to work with colleagues, were viewed more favorably than women who did the same thing. Women desire fair treatment, equal opportunities and equal pay. In an ICEDR study, millennial women cited a lack of interesting and meaningful work as the third main reason for leaving organizations. Female employees want the work they do to make an important difference in some way, such as contributing to the improvement of people’s lives. Paying attention to employee happiness reaps big rewards for organizations. Multiple studies have proven that a gender-balanced workplace enhances employee engagement, increases productivity and profits and improves organizational and brand reputation. Achieving gender balance requires a mix of policies and programs that engage, motivate, recognize and reward, as well as offer equitable pay and career opportunities to women. Employee engagement is mentioned first because an engaged workforce is inclusive, motivated, productive, recognized and rewarded. Giving employees the recognition they deserve is key to employee engagement. For more information on how to engage your employees, watch this webinar recording on Using Recognition to Drive Engagement. To learn more about what makes employees happy by checking out this infographic highlighting results from Achievers’ “New Year, New Job?” survey. As you look to various employees who may be similar in terms of work ethic, company loyalty and passion for the business, look for these leadership traits that set them apart. Employees who exemplify these characteristics will be better suited for a leadership position, allowing you to promote the most qualified and excited employees. Confidence is one of the best indicators of potential success with an in-house hire. Fear of personal failure affects a staggering 31 percent of Americans according to a 2016 survey. The same survey even found that 6.1 percent of respondents had given up a promotion due to fear of failure. They take a stand—not to be right, but because they aren’t afraid to be wrong. They listen more than they speak. They duck the spotlight to shine it on others. They freely ask for help. They don’t put other people down. They aren’t afraid to look silly. They make their own mistakes. They seek approval from only the people who matter. One of the best ways to know if your new hire has leadership potential is the ‘beer and barbecue’ test, according to Brian Scudamore, CEO of O2E Brands: Would you want to have a beer with this person? Would they have a good time and make connections at a company barbecue? If so, the person shows leadership potential, because leadership is all about effective communication. You’ve seen this employee in action, and have a good idea of what their strengths and weaknesses are. If communication is one of them—they tend to be social at group events, often organize fun shindigs in the office, or are always the first person to answer a group email—then they may be one of the top candidates. It’s also important for leaders to recognize others and show appreciation for hard work. Only 41% of employees feel recognized at their desired frequency and 60% feel their managers don’t recognize them enough. Recognition goes a long way and understanding the importance of employee recognition can positively impact employee engagement levels. The best leaders have a good idea of what they want to bring to the table. Business News Daily says that a good internal hire will already be showing signs of this kind of vision. They’ll be motivated, focused, and already striving to make company practices as streamlined as possible. Look for employees that are ‘hustling’ and doing their best to make the company better, rather than simply showing up and going through the motions each day. You can trust that employees who share your vision, and maybe even have their own ideas for the growth of the company, will improve the organization when in a leadership role. Managers are required to think critically every day: “One of the most common duties of a manager or supervisor is to make sure that client, customer, and employee obstacles are being removed or lessened. This includes making sure questions are being answered, proper actions are being taken, and problems are being resolved,” says Lindsey Burke of Select International. Have they shown the ability to analyze a situation thoroughly instead of responding to it immediately? Can they find effective solutions, or do they flounder? Do they regularly offer solutions in brainstorming sessions and meetings? If you’re considering an employee for a promotion, start by giving additional responsibility as a trial; even if they don’t know they’re being considered for the promotion or that this is a trial. Then watch closely as the employee(s) inevitably make mistakes and learn through these new tasks. Employees that show ownership of mistakes they’ve made, and can move past them and see the learning experience that comes out of it, are the employees you want to promote, according to The Muse. The skill of ownership is difficult to teach, but invaluable when it comes to leading a team. Employees that embody this trait will often be the best people for the promotion. Use these tips to find the best candidates for an in-house promotion. There are budding and excited leaders among you, it’s just a matter of finding them. Look for confidence, vision, ownership and more to identify the employees who want to help grow your business and their career. Discover why it’s important to recognize employees and promote in-house by checking out the eBook The Case for Employee Recognition. If you’ve ever touched the recruiting process, you’re well aware that hiring can be expensive! However, you probably also know that making a bad hire is even more expensive. According to Forbes, a bad hire can costs an employer “thousands of dollars”. So what are the best ways to hire with different levels of budget? We’ve helped compile some top tips and tricks for those hiring on any budget. If you only have $50 to spend on hiring you’re largely limited to free options which is not necessarily a bad thing. Sometimes it takes going back to the basics to get someone’s attention. For example, start with printing or buying a help wanted sign and putting it in the window of your business. The best employees are often customers of your business since they already understand what your business does and are obviously willing to support it. You’ll also want to consider posting help wanted flyers on bulletin boards around town. Once you’ve posted your ad physically, you should turn to social media and post it on your company and personal pages. Encourage your employees to share it since they often have friends and a large network who might be looking for new jobs. Then of course, there are the online options. Place your job ad on some of the free online job boards. There are thousands of these boards so pick three or four that best fit your target audience, create an ad, and consider it ready-to-go. Here is a quick list of free job boards to help you get started. So now you have a some money to spend on finding a perfect employee, congratulations! You should still start by doing everything in the under $50 budget because it will maximize your results without taking up any of your current budget. The next step is to start looking at paid options to promote your ad. Although you can’t quite afford some of the more expensive job boards like Monster, you should be able to create job postings on a number of sites such as Indeed, Craigslist and more. Because you can only afford one posting, it is important to optimize that posting as much as possible. A simple Google search on “How to Optimize a Job Posting” can help you take your strategy a step further and increase your chances of getting results from a job listing. As stated before, you should definitely start by doing everything in the budget categories listed above. Fortunately, you now have a fairly decent sized budget to post job ads. You can now afford to post to some of the more expensive job board options such as Glassdoor, Monster, Careerbuilder, etc. or you can create multiple ads on some of the cheaper job boards I already mentioned. Your best bet is to test both options – you never know what works well until you start measuring. If an inexpensive Craigslist ad is working well for you, post a few of them. If not, consider posting to some new job boards. Every business and audience is different, and prefers different job posting channels. The extra budget will give you the flexibility to get insights and take your hiring to the next level with more strategic thinking. If your budget is hitting in the thousands, then you’re given the opportunity to heavily invest in hiring top talent and that will pay off big time. At this level of budget you have much more flexibility as far as advertising your job opening. In addition to the previous budget levels, you can look at hiring more specialized recruiters that focus on specific industries and job types. Consider hiring someone to write great job ads for you – the right job ad copy can dramatically impact the amount of applicants that come through. To prevent wasting your budget however, you’ll want to test different options to see what works. Start by looking into paid packages on job board platforms that provide you more features to help distribute and measure your job postings for maximum performance and impact. The next time you’re recruiting with a new budget, consider our top tips and tricks. With today’s competitive job market, it’s important to recruit smarter in order to bring in a strong job candidate pool and hire the right person for your company. To learn more, check out the white paper The War for Talent is Here: Is Your Workplace Ready? Will Zimmerman is a content marketer for Proven, the small business hiring tool. He is from Boulder, Colorado, and when he’s not writing awesome content, he enjoys all things outdoors including, but certainly not limited to, skiing, camping, hiking, and surfing. It seems like nearly every company I’ve worked with is struggling to attract and retain strong technical resources, whether their organization competes in the technology space or not. We can chalk up the demand to the advancement of science and technology’s role in nearly every industry, service, and product out there—combined with a shortage of the necessary STEM (science, technology, engineering, and mathematics) talent to support those needs. And while there’s a lot of literature available on how to meet the needs and expectations of this audience, it seems worth adding a few words on this tricky employee group, specifically in regards to performance strategies. Let’s start with the employee’s point of view. While acknowledging that no two people will ever want or care about the exact same things, some macro themes come up again and again that resonate with STEM-oriented personalities. First, this group cares a great deal about their skills, knowledge, and experiences. They want to be current in their field, work with the latest and greatest in technology or science, and rub elbows with the best and brightest. Second, they like to be recognized for that mastery. This recognition can come in many forms, such as awards and certifications, patents, published works, or speaking at conferences—or simply being recognized by their peers as a ‘rock star’ in their space. They also care deeply about having the freedom to invent, build, design, explore, and play in their field. After all, how can you ever be a master if you don’t have the time and space to practice your craft? Now let’s look at what the organization needs from this group. Clearly, the aforementioned mastery skills are important to organizations. Yet many companies struggle to give STEM talent the tools, training, and experiences needed to stay on the cutting edge of their field of practice. The more the performance solution you build for them can focus on identifying and aligning your best technical talent to the ‘coolest’ work, the better. Another common tension organizations face is wanting all that STEM brain power aimed at the right work, rather than being distracted by other things. While we definitely want to put more focus on directing that talent to the best work, we also need to balance that with this groups’ desire for time and space to do their own thing. I get it: when you’re short on critical technical talent, it’s hard not to fully dedicate the talent you do have to your priority agenda items. However, you need to be a little more flexible to keep this very agile group happy. Google and other forward-thinking companies have proven that letting your people use some percentage of their time on their own pet projects pays big dividends down the line. Invest in building clear technical career paths, and in creating the content necessary for enabling and communicating those paths. Share information on how they can build their mastery within your organization, and provide them with resources outside the walls as well. Ensure that your talent review processes prioritize mobility. In other words, keep your STEM talent moving across the org to increase collaboration, the sharing of knowledge, and to enhance their growth, experiences, and learnings. Celebrate their brilliance (often). Find ways to highlight progress, solutions, invention, things of beauty, and innovation. This may be at a team level as much as it is at the individual level. Recognition can be as simple as a toast at the Friday happy hour or as formal and highly visible as company-wide recognition like displaying patents or other awards prominently in the office halls, or granting annual innovation awards internally. Tamra Chandler is a bona fide people maven. She’s spent the majority of her career thinking about people, researching how they’re motivated, and developing new and effective ways for organizations to achieve the ultimate win-win: inspired people driving inspiring performance. She’s also the CEO and co-founder of PeopleFirm, one of Washington State’s fastest-growing businesses and most successful women-owned firms. An award-winning leader in her field (she’s been recognized by Consulting Magazine twice as one of the top consultants in the U.S.), she is the author of How Performance Management is Killing Performance — and What to Do About It. Robust onboarding programs are now the new norm, or at least expected to be, in strong-cultured companies. Studies show that when you invest in a new hire’s experience in the first 90 days, their performance over the lifetime in that company is drastically higher than those without a strong orientation. A parental leave can last anywhere from a few weeks in the States, to one year in Canada, or as much as 14 months if you live in Sweden. When you work for a high growth company, a lot can change in that time span so coming back to work can be a real whirlwind. These returning employees don’t want to be treated like a new hire — their time is more valuable than that because they bring with them a wealth of knowledge and experience from before their leave. However, they’ll likely need to be re-introduced to how their team is functioning, how company priorities have changed, and how processes have been adapted to reflect these changes. Familiarizing them with what’s being done differently sets them up for a successful transition, so they can get back to work without missing a beat. Similar to parental leave, being off work for a medical reason may not always be a large chunk of time. But the length of time is relative — innovative companies change quickly, and what was standard policy a month ago may be ancient history now. Medical or stress leaves can be due to a huge range of circumstances, and sometimes a full recovery requires a gradual or modified transition back to full-time work. Understanding how to meet the needs of your employees as they navigate this adjustment requires a completely different on-boarding process, and accommodating their needs will be crucial to setting them up for long-term success. Whether it was an extended leave to travel, to work at another company, or to further their education, these employees were gone for a while…and now they’re back! They know the ins and outs of how your company has worked in the past, and need to get the update of what’s new and different since they were an employee last. This group may benefit the most from being treated like a new hire and going through the onboarding process again, depending on how long they’ve been away. Each situation will be different, and will need to be handled accordingly. If they go through onboarding again, know that they will be familiar with a lot of the information. So make good use of this, and use their expertise to assist in the orientation process for others! We’ve all seen it done before — it’s easier to hire contract employees and put them right to work. It’s a sneaky way to avoid the initial start-up costs associated with a new hire (including training time and technology requirements). But after a while, it’s not uncommon for contract extensions to turn into a full-time-esque role…without ever giving that hire the proper training. After all — they’ve been around for so long, they already know how things work. Knowing that it may be tedious to put them through a full new-hire orientation experience, these people managers need an expedited onboarding process for bringing on contract employees. Spending time on this process ensures that your team is all working under the same guidelines and it creates a more seamless work experience (and cultural structure) for everyone. Human resources and new-hire orientation trainers are rarely charged with creating an experience for these groups. And, in some cases, rightfully so. These orientations or re-orientations can come with so many variables and exceptions, that they are best managed by the person’s direct supervisor. When the manager is involved in creating the onboarding experience, they know what actually needs to be included, rather than going through the standard onboarding experience for a new hire. Nobody likes to feel like their time is being wasted. If HR departments don’t trust their people managers to lead this process — then it’s better to spend time investing in developing stronger managers rather than creating another standalone program run by HR. Case-by-case exceptions require case-by-case action. Let your people managers handle that. Teach your managers how to execute a stellar onboarding process, and they’ll develop great leaders from the start — whether that’s the start of day one, or the start of day 501. Training people managers to be responsible for the entire talent lifecycle — from sourcing talent to final exit — is one of the outcomes of the Manager Start Line, my online management training program I’ve designed to take your people managers (and business) to the next level. Contact The Corker Co today for more information and learn more lessons like this at my talk at Achievers Customer Experience (ACE) 2017. Join me at ACE 2017 September 12-13 where I will be speaking on Am I Good at Managing … Myself? Check out details of my speaking session and the major HR event here. Matt Corker is the co-founder of The Corker Co and creator of The Manager Start Line, an online training program designed to take leaders’ people management skills to the next level. Matt has trained individual managers and their teams in organizations including lululemon athletica, Kit and Ace, Spiritual Gangster, The Westin Resort & Spa, Nurse Next Door, and the University of British Columbia. An employee’s success at a job can’t be predicted by his or her resume and experience. That piece of paper doesn’t tell you the full story. Sometimes, an individual’s soft skills or personal habits are a better indication of their aptitude and potential to succeed. If you can identify these common traits that successful employees share, you can find high-quality employees who will help your company thrive. Here are eight habits to be on the lookout for during your next round of hires. Between co-workers, supervisors, customers and/or clients, there are many different personalities in a professional organization, so it’s unlikely that you will like everyone you encounter. Despite this, the most successful employees treat everyone with respect, regardless of personal feelings. They treat their peers and employees they manage with the same level of respect, which makes everyone feel valued and appreciated. This mutual respect in the workplace creates a positive work environment. “When people work with one another with peace and harmony, they don’t have the time to focus on other shallow and petty ideas,” according to experts at Wisestep. “People will be more interested in finishing their assignments and boosting the levels of productivity at work.” Successful employees understand that respect is a two-way street. If they respect others, they will receive respect in return. Question to ask: How did you handle a disagreement with another employee in the past? Individuals who truly make a difference on a team or in an organization are the ones that go above and beyond the call of duty. They don’t just do what’s asked of them, they look for opportunities to take the lead or solve problems. Managers love these types of employees because they can work independently and don’t need to be micromanaged. Question to ask: What is one instance where you took initiative, either at work or at home? What did you do and why? Professionalism isn’t determined by an individual’s experience. Instead you see it in their intangible personality traits; the way employees carry themselves in the workplace. Are they punctual or do they frequently show up late? Are they dressed appropriately and look put together or do they look like they just rolled out of bed? Do they take pride in their work and produce a product they’re proud of? Do they raise their hand and contribute insight during meetings or do they speak out of turn and interrupt other employees? Question to ask: Give me an example of how you bring professionalism to your work. It’s easy for job candidates to “talk themselves up” in an interview, but can the candidate talk about their successes within teams or the greater organization? Of course, everybody wants to achieve some level of personal success, but successful employees know how to be selfless. They understand when to put the company first and why it’s important. This is especially important for managers and executives that will be representing your organization at client dinners, when networking, during sales calls and more. Making sure these types of employees can frame success within the greater organization is especially crucial as these interactions can inform how non-employees perceive your company. “Authenticity is important for establishing reciprocal relationships with others in the executive arena. Long-term, rewarding professional partnerships don’t begin with a selfish attitude,” says Ted Rollins, global entrepreneur, Co-Chairman and Founding Principal of Valeo Groupe. When your employees show selflessness, they’re able to establish better relationships that ultimately improve your company and its reputation. Question to ask: Share an example of when you were selfless at work. Why did you do that and why do you consider it selfless? Whether they’re managers, mid-level employees or entry-level workers, successful people constantly strive to improve. They’re not satisfied with the status quo and look for opportunities to get more from themselves and their team. These individuals appreciate constructive criticism and feedback because it gives them a chance to learn and improve. If you can find employees with this desire and cultivate it within the workplace, you can be confident they will work hard to improve themselves and push the company forward. Question to ask: Do you have any side projects or skills you’re trying to improve right now? If so, tell me about one of them. Successful employees are honest and take responsibility for their actions. This means that if something goes wrong—they miss a deadline or produce subpar results—they own up to their mistakes rather than looking to blame others. Suha Abughosh, a bank Regional Manager has another way of looking at this, suggesting that responsibility is the same as accountability: “For example, instead of following up with other teammates to ensure the project is completed timely, the unaccountable worker forgets about the project the minute it leaves her desk,” she says. How do you pick this person out of the crowd? Abughosh explains, “If the project’s deadline is missed, she’ll be sure to let everyone know that she did her part.” Pinpointing this during hiring is critical to avoiding resentful feelings among co-workers later. Question to ask: Tell me about a time when you messed something up, at work or home, and owned up to it. Long hours, multiple projects and demanding deadlines can cause stress in an office. While it’s natural for workers to feel stressed, successful employees are able to stay positive. Question to ask: How do you stay positive when work or a project is stressful? What are your tactics? Successful people understand their limitations. While they’re eager to take on projects, challenge themselves and take initiative, they’re also realistic about what they can do. This means they’re not afraid to say “no” if they have too much on their plate, because they always want to do their best work. Question to ask: Have you ever said no to a project because you had too much on your plate? Tell me about that experience. When interviewing potential employees, try focusing on identifying employees that exhibit the traits and habits listed above. Employees that exhibit some or all the qualities as described above are more likely to positively impact your company. For more advice on how to effectively use your interview process to identify top performing employees, check out Why Recruiters Should Consider Structured Interviews. Jessica Thiefels has been writing for more than 10 years and is currently a professional blogger and freelance writer. She spent the last two years working tirelessly for a small startup, where she learned a lot about running business and being resourceful. She now owns her own business and has been featured on Forbes. She’s also written for StartupNation, Manta, Glassdoor and more. Follow her on Twitter @Jlsander07 for more small business tips and ideas. You may not be so unstructured as to totally wing it in an interview, but think of all the small talk you probably make over the course of interviewing someone. An unstructured interview might lead you into a 10-minute conversation about a shared interest with the candidate, like fishing or the movie you both saw recently, instead of working toward determining the viability of the candidate in fulfilling the duties of the vacant position. Biases prevent employers from hiring people who actually fit the job. Allowing your biases to influence your hiring decision can result in hiring a bunch of people you just, well, like. Structured interviews help keep you from basing your hiring decision on how you “feel” about a candidate, or just because you have something in common with a candidate. It doesn’t matter that you both like fishing or both cried when you saw the movie “Lion.” A structured interview lets you rely on empirical data that you collect from each interview and helps reduce unhelpful biases. Dr. Sullivan points out that “structured interviews reduce bias by focusing on relevant, job-specific factors and past performance rather than on personal characteristics. Questions focusing on what you expect for accomplishments and on evidence of past performance will reduce bias.” One common example is what psychologists call confirmation bias: we judge the candidate in the first five minutes (or maybe 30 seconds), and spend the rest of the interview selectively hearing only what confirms our preconceived judgement. A structured interview format is one in which all candidates (no cheating–this means ALL) receive the same questions in the same order, and are evaluated using the same metrics. Think of it as a science, not an art. You need clear criteria with which you’ll assess each candidate’s responses. Start by identifying or reviewing the competencies of the particular job. What is actually required to succeed in this role? Base your metrics entirely on this question. Be wary of traditional metrics like GPA and school attended. Use a rubric that helps interviewers assess each response that candidates give. In addition to avoiding the unstructured whims and common biases, the rubric helps avoid the impact of your team’s varying moods. Even if you’re having a bad day, you can rely on the structured interview to function the same way every time. See? A science. An additional benefit of using structured interviews is that they are also significantly more defensible in legal situations, largely because they provide more detailed, objective hiring criteria. A structured interview doesn’t have to be dry or disengaging. Your hiring team may resist a structured interview, claiming they are boring or overly rigid. These tips can help to get the team on board. Most importantly, the candidate should have a positive experience during a structured interview. In fact, you will decrease the likelihood that candidates walk away feeling judged unfairly. In the opposite scenario, candidates who don’t seem to relate to their interviewers on a personal level (because they don’t like fishing, for example) will feel disengaged and less impressed with your organization. Remind them that the point of the exercise is not in asking cool questions, but in hearing how the candidate answers. It might seem fun to ask someone what they did over the weekend or which famous actor they most resemble, but remind your team that this is not the best way to find a candidate with the right skills for the job. The hard part is making sure the hiring team sticks to the questions. You might have a rogue interviewer who resists the questions and continues to go off on tangents with the candidate. Show this person the hiring rubric you’ve created with the team, and demonstrate how those unstructured questions cannot be evaluated within the rubric, and thus bring subjectivity into the process. Tell me about a time you had difficulty working with someone (can be a coworker, classmate, client). What made this person difficult to work with for you? While there is no one way of ensuring your interview process is completely free of bias, determining a universal set of criteria, based on job functions, can help minimize the impact of preconceived notions. To learn more about how to hire top talent, check out Achievers’ blog post on harnessing culture as a recruitment tool. 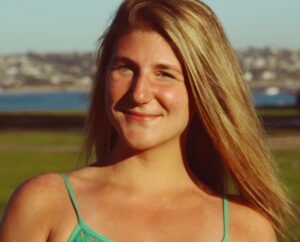 Anna is the Content Manager for College Recruiter, which believes that every student and recent graduate deserves a great career. College Recruiter features thousands of articles, blogs, videos, and other content as well as 300,000 internship and entry-level postings for open jobs. 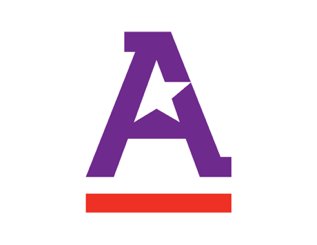 Anna and her team of writers produce content for talent acquisition professionals, as well as entry-level job seekers. Her prior experience at nonprofits has made her an expert in directing volunteer recruitment and a champion for diversity and inclusion efforts. Connect with Anna on LinkedIn. How fast time flies! Can you believe it’s already 2017? Every time a new year rolls around, I like to reflect on the previous year. For Achievers and the Engage Blog, 2016 was extremely eventful. For starters, Achievers’ Customer Experience (ACE) 2016 was a huge hit, with amazing keynote speakers, including famous journalist Joan Lunden and CNN commentator Mel Robbins. From the 50 Most Engaged Workplaces Awards Gala to a stellar lineup of speaking sessions, ACE 2016 brought together a Who’s Who of top performers and thought leaders in the HR and employee engagement space. If you weren’t able to make our biggest event of the year last year, no worries. We have the sizzle reel right here for you to watch! Stay tuned, registration for ACE 2017 in New Orleans opens in just a few short months. Here on the Engage Blog, readers enjoyed a wide variety of HR topics in 2016. Trending topics ranged from employee turnover and talent management challenges to top company perks and thought leadership on the hot topic of employee engagement. To recap the hottest HR themes from last year, we’ve compiled our top 10 blogs of 2016. A must-read for HR pros – and employee-focused management of all stripes. 30 Fun, Fresh Ideas for Employee Appreciation Day – Or Week! Which Company Perks Attract the Best Talent? As we enter the New Year, let’s remember that great customer experiences start with a great employee experience. And it shows up in the bottom line too! According to Gallup, companies with highly engaged workforces outperform their peers by 147% in earnings per share. Start by focusing on employee happiness, and you’ll soon see a positive ripple effect across your entire business. Here at Achievers, we want to take this opportunity to say “Thank you!” to our readers. We appreciate you taking the time to read and share the articles we put a lot of thought and love into creating, and we look forward to bringing you more great HR content on the Engage Blog in 2017. Keep a lookout for new guest blogs from top HR influencers and powerful insights surrounding employee engagement, leadership, work culture, rewards and recognition, recruiting and hiring, employee retention, HR technology, and more. Cheers to 2017! Kellie Wong is the Social Media & Blog Manager for Achievers. She manages Achievers’ social media presence and The Engage Blog, including the editorial calendars for both. In addition to writing blog content for The Engage Blog, she also manages and maintains relationships with 25+ guest blog contributors. Connect with Kellie on LinkedIn. When it comes to attracting talent, competitive pay and great benefits are two big factors. But there’s a third factor that’s high on the list: company culture. For some professionals, the opportunity to work for an organization with a productive culture that aligns with their own values and work style may even outweigh compensation when it comes to deciding on whether to take a particular job. So if you’ve put in the work to build a great company culture, it should be front and center during as you seek to find the best employees. Ideally, your company’s founding leadership fostered a desirable corporate culture from the outset. However, even if that’s not the case, it is never too late to drive change. Culture is the glue that holds an organization together, and the type of glue you use matters. What does your company stand for? What are your values? What is your vision? What do you want your company’s reputation to be? A culture cannot simply be defined in an email and handed down to employees. Sure it has to start at the top so everyone knows that culture is a priority, but everyone needs to buy in and believe that their needs are being met in order for the culture to take root. Every employee is expected to live the values, lead by example, and stop behaviors that violate company standards and shared cultural norms. Teamwork. Build a team instead of a group of people. Collaboration should be valued. Integrity. Without honesty and integrity, a company is destined to fail. A culture should embed the expectation that all employees act ethically and lawfully. Safety. A company must protect the health and safety of its people. Employees need to feel safe and know that the company will provide them the right tools to do their jobs. People Focused. One of the easiest ways to lose top talent is to fail to develop them. Passionate employees want to continually grow and develop their career. They want to reach their full potential, and they need their employers to empower them to do so. Customer Success. Businesses should strive to be customer centered by building close partnerships with their customers and having a strong desire for their customers to be successful. Quality. Employees should value high-quality workmanship. Shortcuts should not be allowed. The company’s reputation rides on the quality of each individual product that is delivered. Innovation. Creativity and intellectual risk taking should be encouraged to continually move forward in an ever-changing market. Recognition. Recognizing both individual and shared accomplishments, especially when they reinforce shared values, is one of the most effective ways to define a positive, shared, corporate culture. Once your culture is defined, it needs to be deeply embedded and reinforced. Is your culture so rooted in the organization that it is woven into meetings, company emails, and informal conversations? Do you have a formal recognition program in place that reinforces shared company values and bolsters corporate culture? Once you have a well-defined culture in place, you can use it to recruit top-notch employees. A great corporate culture will cause employees to seek you out. People want to work where they are valued and where their hard work and contributions to the success of the company are recognized. So it only makes sense to hire people whose personal values mesh with the values you desire. According to the Harvard Business Review, “If you assess cultural fit in your recruiting process, you will hire professionals who will flourish in their new role, drive long-term growth and success for your organization, and ultimately save you time and money.” Here is how to do it. Your website, your publications and your job postings should advertise your company culture. When a potential candidate walks into the lobby and through the office building for an interview, is the culture you aspire to evident right away? Your company’s mission statement and values should be promoted and clearly visible all over your place of business. Do not make potential candidates guess as to the type of person you are looking to hire, or what values they should share. Furthermore, don’t just tell potential candidates about your company culture with words. Show them. Encourage team members to promote your company’s culture on social media. Post pictures of company outings, community service projects, and successful project completions. During interviews, give candidates a chance to talk to other employees. Take them on a tour and point out behaviors that exemplify your culture. Give job seekers a chance to see what it would be like to work for your company. The interview is your opportunity to determine if the potential new employee is a cultural fit for your business. The most intellectual person on the planet with pages and pages of credentials may not thrive in your company if they do not model the values you are looking for. It is essential that you ask questions to help you determine if someone will reflect the behaviors and beliefs that are crucial to your corporate culture. What are the things on your life that matter most to you? How would you describe a desirable Work-Life balance? How would you describe the perfect company culture? Having a strong corporate culture is not only important, it is strategic. Savvy business leaders know that the right culture attracts the best employees. Talented and career driven individuals seek out companies that embody the values that are important to them. The bottom line is that when an employee’s personal culture aligns with the corporate culture, the company will prosper. Use your corporate culture as a marketing tool and watch your business blossom in success. To learn more, download the eBook All for One and One for All: Uniting a Global Workforce with Company Culture. Melissa Ricker covers business and career topics for JobHero. The goal of every recruiter is to find a candidate that perfectly fits the open position. In fact, perfectly aligning a candidate with a company is the most rewarding experience a recruiter can have. When you hire the right person your company likely will not incur costs such as time lost in further recruitment efforts or in training somebody that might not be a perfect fit. To avoid extra costs, companies large and small alike need to find better ways to identify, attract, and subsequently retain top talent. The million-dollar question is: how? The most attractive companies take all of the great benefits they offer and then adapt them to the position they are seeking to fill. For example, a senior engineer is likely older and more established compared to a candidate just entering the job market, perhaps emphasizing childcare assistance rather than the Friday night team outing would be more enticing .For an example of how offering great fringe benefits can help attract top talent, look no further than Google. Show candidates that you not only have a plan for their immediate future, but also how you plan to provide growth opportunities. Demonstrate knowledge of their current skills to ensure that they are in the right position, then show them the way forward through a clear training and development track. Engaging with potential candidates on social networks such as LinkedIn can be useful, even if the candidate isn’t currently interested in the position you’re offering. A good way to approach this is by sending a message to the candidate with a link to your company website. You can also use a tool like SalesWings LinkedIn message tracking to score the level of interest of the lead. Perhaps the lead clicks on the link but doesn’t show any interest at the moment. With message tracking you at least know that they clicked on the link, so you can follow up by providing more information if necessary, hoping that the same lead will one day turn hot. Remember that 75% of professionals are passive candidates – meaning they’re not actively engaged in a job search – so it pays to have any edge in order to grab top talent before your competition does. Showing candidates the great opportunities that come with working for your company can be a fantastic recruitment tool. For instance, giving examples of succession plans or the career progression plan of already hired talent recruited into a similar position can instill a level of confidence in the candidate that their employer will work to further their career. A company should be up front about what is needed in order to be successful in a new role. If a candidate needs to develop new skills, the company should accordingly have a plan for how to help them develop those skills. Be open about internal and external training, any smart candidate will immediately see the benefits of developing their skills as they will have something to add to their CV. 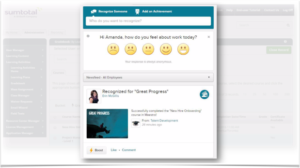 Finally, talk about your company’s embrace of employee recognition. Employees crave employee recognition, with 93% of employees hoping to be recognized quarterly, if not more frequently. Share your company’s enthusiasm for recognizing great work and how employees are rewarded, whether through monetary rewards or social recognition. Top candidates usually target high ranking “Best Places to Work” companies. Everybody loves to work for a company that treats employees well, so it is a good idea to exhibit the qualities the aforementioned high ranking companies do. Even if you don’t get acknowledged for your efforts immediately, you will still have taken important steps to make improvements in this area. Integrate every digital marketing tactics into your recruitment efforts so that your talent acquisition team can identify, attract and engage with talent more easily. With this strategy, you can also target potential candidates before they begin their job search in earnest. The day they make their decision to leave their current company, candidates will send applications to a large number of other companies or agencies. With this method you can beat them to the punch, and be the company all other recruiters are competing against. Demonstrating why your company is a great place to work is becoming a critical part of recruitment strategy. The LinkedIn report MENA recruiting trends 2017 reveals that over 81% of leaders in MENA countries need to invest more in employer branding. This is because employer branding has a significant impact on hiring top talent. Your corporate website and LinkedIn page are great places to build your employer branding. A poor user experience on the career section of your website can negatively impact your brand, meaning you will receive fewer applications in general, let alone those from the top talent in your industry. A great example of an employer branding strategy comes from Starbucks. In 2015, they used Twitter and Instagram to promote their brand. Potential hires had the opportunity to communicate with current employees by using the hashtag #sbuxjobschat. This allowed them to learn what inspired people in their jobs and what people look for in a company. To sum up, communication is key to attracting top talents – if you don’t explain why your company is a great place to work, you will not attract the best candidates. Good luck and best wishes for a fruitful and rewarding new year! If you’re looking to lure top talent, check out the blog post 12 Tips for Writing the Perfect Job Description. The author Sara Sayegh-Moccand is a digital marketing specialist at SalesWings, a website tracking and lead scoring add-on. The software identifies your most sales-ready leads based on their website activity. It analyzes your leads’ past and future visits and scores their level of engagement/interest. The question of how to measure employee performance represents one of the last vestiges of old-school HR methodology. Today’s workforce is digitally transformed, highly social and mobile, made up of multiple generations, and collaborating across virtual and global locations. There has been a profound shift in the workforce away from hierarchical, top-down organizations towards teams and collaboration, where having a culture of recognition can drive engagement and results far more effectively than infrequent reviews handed down from on high by management. We all want the best hires and to lure the top talent. But once on board, they’re part of the organization, and now making sure that they’re fully engaged becomes the challenge. But how do we know if they are working up to their potential? Old-school approaches to performance management, which view a single employee outside of the context of today’s team-based, networked workplace, no longer ring true. Indeed some would argue that many of these approaches were myths to begin with – and I’d have to agree. Myth #1 – Individuals should be judged solely on their own performance. The idea that we perform as an island may apply to an isolated few, but it doesn’t fit the majority of workplaces — either today or yesterday. The investment made in working out how to evaluate individuals may be better spent evaluating the quality of their team or business unit’s output. What targets have been hit? What goals have been reached? Perhaps we should be evaluating employees not only on their performance, but on their level of engagement and on their ability to thrive in team-based environment. Highly engaged employees are more likely to give the kind of discretionary effort that all bosses are looking for, and that have a tangible effect on a company’s bottom line. In fact, Aon Hewitt has reported that for every incremental one-point increase in employee engagement organizations saw a 0.6% increase in sales. For a company with sales of $100 million, this translates to a $6 million windfall! And in companies with the most engaged employees, revenue growth was 2.5 times greater than competitors with lower levels of engagement. Myth #2 – Good employees just do the job, they don’t need a reason or added meaning. Is the better employee really the one that doesn’t need to understand how their work aligns with company’s mission and values? Performance stems from engagement. And being engaged stems, in large part, from feeling aligned to — and invested in — the company purpose. Motivation and meaning go hand in hand. Even if a task is performed well, accomplishing it inside a vacuum is going to create a gap somewhere along the line. Employees deserve to know why they’re there. They’ll participate more fully, and are more likely to push to reach targets and goals if they are invested in the rationale behind the effort. Myth #3 – An employee that’s good this year will be good next year. When a team of researchers dove into six years of performance review data from a large U.S. corporation, they found that only a third of high-scoring employees scored as high in subsequent years. And they found no evidence that high-performing employees always perform highly, or that poor performing employees perform poorly. Today’s workforce is continually being met with innovations that require new learning and new skills, so what’s “good” today may not be an accurate measure of what’s desirable tomorrow. When a company uses trackable learning platforms, they have a means of measuring growth and development. To drive engagement and retention they can extend from onboarding programs, demonstrating a commitment to an employee’s growth from the moment of hire. 84% of employees want to learn, and keep learning. When you align an employee’s learning with the company’s business goals, that’s a win for all. Myth #4 – Past performance is indicative of future results. In 2015, a number of Fortune 500 companies announced that they were doing away with old school performance reviews. Accenture, the Gap, Adobe and General Electric all veered away from the annual or quarterly review ritual in favor of building a stronger culture based on continuous feedback and frequent recognition. What’s happening instead is that many companies are moving to a system where employees and managers can give and receive social feedback and track the history of recognitions given and received. This new approach – measuring the frequency of peer-to-peer, intra-team and team recognitions within a powerful digital and social recognition program – provides better quality insights and has the potential to foster a far more positive, and productive, work culture. 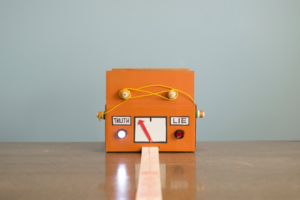 Myth #5 – The best way to measure performance is when no one’s expecting it. Spot checks, random and unexpected, are still recommended by some HR stalwarts, who assert that it’s a way to motivate employees to give a consistent performance. But it conveys an atmosphere of mistrust that may be more of a de-motivator. Trust is critical to employee engagement, but it’s still in short supply: a recent survey of nearly 10,000 workers from India to Germany to the U.S. found that only 49% had “a great deal of trust” in those working above and alongside them. Contrast that with study findings showing that organizations are extremely concerned with driving engagement and promoting a workplace culture that is based on transparency and meaningful work. You can’t have both. That we’re still having this conversation is in part because we may lack the imagination to see our way to a new starting point. But the real drive to perform comes from within. We are motivated by purpose, and by being appreciated for what we do. Employees today want to be engaged, we want to know what higher purpose our efforts are contributing to, we want to excel and to grow. Employers should start with that knowledge and measure their employees accordingly. Make sure to check out the other series of guest blogs from Meghan Biro, starting with her first guest blog post For Recognition To Have An Impact, Make It Strategic. Imagine all of your employee recognition and rewards programs; everyday recognition, innovation, recruiting referrals, or years of service awards; even sales incentives, on one platform. It’s the place where everything belongs: A place where you can align every employee, globally, on a single platform and make your recognition and rewards budget go further by leveraging combined data from every employee rewards program. A behavior-driving engine that aligns your employees to your business objectives and company values, fueled by recognizing and rewarding shared victories every day. And because it was purposely designed based on the familiar and fun-to-use social media model, it’s an HR software platform that everybody actually wants to use. That is the basis of the Achievers recognition and rewards platform. But we also recognize that not all employees are able to be on our platform 24X7, so that’s why we decided to extend the reach of our platform through an Open API – to make it as easy and seamless as possible for employees to send and receive recognitions in the everyday flow of work. What are we trying to do with our APIs? Most organizations use anywhere between 10 to 16 different software systems to run their business. These systems can range from document management systems like SharePoint and Confluence, to project management software like MS Project and Merlin, to intranet portals enabled via Jive, to social tools with a newsfeed, instant messaging and email, and many more. Employees spend at least 30 hours of their work week in their email and other collaboration tools. Every organization today is, on some level, a technology company and leverages technology in many forms to increase employee productivity and improve their top line. At Achievers, we recognize this and want to be where employees spend most of their time. We want to be where the work gets done – and we are making this a reality today through integrations. 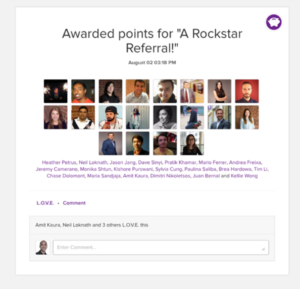 With these and future integrations we are enabling employees to recognize each other and post recognitions to our platform from the other software platforms they use every day. How does Achievers manage this? By having an open, public API that any organization’s developers can use to connect their software systems with ours, programmatically. We live in a world that is incredibly fast paced and every term out there is abbreviated to save time. Whether it is business terms like ROI, Capex, and BAU or social acronyms like LOL, OMG, and ROFL; initialism is ubiquitous in our lives. One acronym that presents itself frequently in tech circles is the lesser known, but equally powerful API, or application programming interface. What is an API? Let’s break it down into its component parts. Application: If you have a smartphone, you are well acquainted with applications, they are the tools, games, social networks and other software that we use every day. Achievers is an application that facilitates employee engagement. Workday is an application that lets you maintain employee files for your workforce. Programming: Programming is how the developers create all the software that make our lives so much easier. Interface: An interface is a programmatic connection shared by two applications that allows them to communicate with one another. An API is essentially a way for two different software systems to communicate with each other via a pre-defined, well understood and agreed upon standard. In other words, it is a set of standard specifications developed by the host service owners that developers, who are familiar with other systems or services, must follow when connecting systematically to the host service. The API lays out the functionality that is available in the host service, how it must be used, and what formats it will accept as input, or return as output. Why did Achievers build its API? Every recognition on our platform has a story. It is an interconnected series of events that starts with an accomplishment, business or personal, by an employee. These accomplishments can be as simple as exhibiting a desired behavior like, “going the extra mile.” Or they can be specific, like achieving a sales goal. This sense of accomplishment is motivating in and of itself, but it is an even more powerful motivator when it leads to a recognition given by a leader or peer, with that recognition reinforcing and perpetuating the employee’s behavior, or accomplishment. While we have the desktop and mobile versions of our software currently available to our members to facilitate recognition, we know that these recognition stories can happen anywhere in an organization’s software ecosystem. Employees need an easy way to recognize their peers from whatever system they are working in when they discover a colleague’s accomplishment. It won’t matter if the employee is on the shop floor, using a point of sale system, answering calls in a call center, in the warehouse, in email systems like Outlook, or in instant messaging systems like Slack or Skype, they can create and send a recognition. Have you noticed how common the Facebook like button is on the internet now? You can basically “Like” content on any website and it will magically appear on your Facebook news feed. Imagine if there was a “Recognize on Achievers” button on all content inside all of the systems that your employees work in every day, allowing them to recognize the creator of that content. Fostering a culture of recognition and driving employee engagement isn’t easy, but technology can make it seamless for employees to interact with our system. It can increase adoption and thus further the culture of recognition. Our aim is to support this philosophy with our product, and that is why we have built our API and will continue to invest in it and in the app ecosystem around it. Many organizations have already adopted our API and created some amazing integrations. 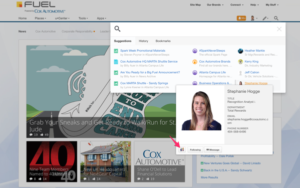 Cox Automotive, one of our more forward-thinking customers, used our API to build an integration that allows recognitions to be sent from within Cox’s Jive Intranet portal. A link to recognize an individual appears beside each person’s profile on the portal. Clicking the link opens the Achievers application in a new tab, with that employee’s name pre-populated and ready to be recognized. 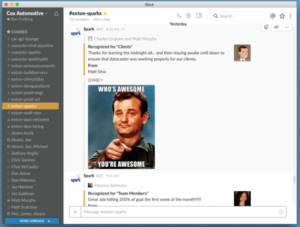 Another popular integration we are seeing amongst our customers, Cox included, is to use our API to link their instant messaging tool, Slack to the Achievers platform. This link allows employee to recognize anybody from within the Slack chat window. 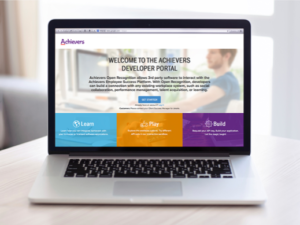 Future integrations could include linking Learning Management Systems to the Achievers platform via our API. This would facilitate the automated posting of an achievement to Achievers whenever an employee finishes a learning course or mandatory training module, reinforcing to teams or to entire organizations the importance and value placed on completing courses. The Achievers API can also be used to transfer the recognitions and achievements of all employees from the Achievers platform into whatever performance management system your organization uses for periodic reviews. Most of us can barely remember what we had for dinner yesterday, let alone remembering what people on our team did 6 months ago. This integration can help provide a more informed review, allowing managers to see all the recognitions they’ve sent, as well as any recognitions their team members have received throughout that period, directly within the performance management system. Recruiting talent is hard. At Achievers, we believe that A-Players know other A-Players. We use Jobvite to get out to our employee’s social networks and drive referrals into the platform. Our API then allows Jobvite to automatically recognize and award points to employees who successfully bring in a referral. What do you need to do next to take advantage? The answer, if you’re already an Achievers customer, is: very little. Do you have access to software developers that can be deployed by HR, or have friends in the IT department? If the answer is yes, you are in business. Talk to them and introduce them to our Open API at https://developer.achievers.com/. Even if you don’t see a use case for using our API, we are confident that they will. Encourage them to reach out to us at: api_support@achievers.com if they have questions or are looking for inspiration. If you’ve identified the direction you’d like to go, but would like a little assistance to ensure your development team and business stakeholders are on the same page, Achievers also offers an API Consulting Service to help you and your team implement the changes and ensure your employees are aware of how this will benefit them in their flow of work. Reach out to your Customer Success Manager for more information. 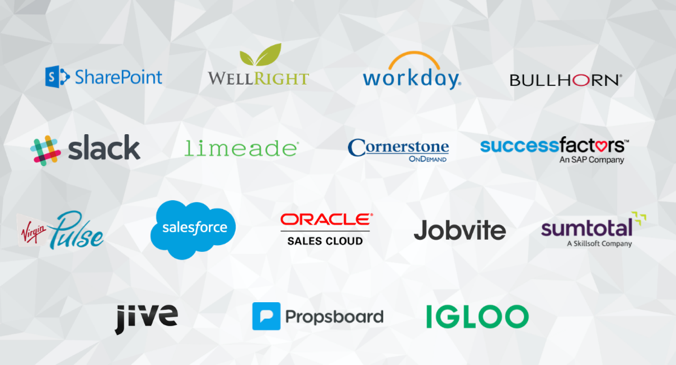 Finally, look at our list of existing or planned integrations and see if there is any overlap between our list and what you use in your organization. If so, we can get you started right away. What’s exciting about the world of APIs and app ecosystems is that it has opened new doors for our platform that we hadn’t even thought of yet. We are at an incredible point in our journey at Achievers. We have never been better poised for innovation in the space of employee engagement than we are now and we invite you to join us as partners on our journey. Let’s engage more employees by integrating more systems with the Achievers recognition platform using our Open API. Amit Kaura (@Iam_amitkaura) is a technology leader at Achievers and is helping build the next generation Employee Success Platform. The platform provides digital systems for sharing recognitions, feedback, and suggestions and allows you to humanize the workplace by digitizing and thus magnifying the positive interactions among the workforce. Skeletons in closets, magic disappearing acts, and people masquerading as someone else: Is Halloween coming or is it just the normal everyday stuff of HR nightmares? This year, avoid spooky business in the office by brushing up on these important HR trends. A recent survey by Leadership IQ reported that, “46 percent of newly hired employees will fail within 18 months.” Forty-six percent! And it isn’t that you read their resumes wrong or they falsified their background and experience — it’s that those new hires simply are not a good fit for your company. When recruiting, ensure you’re hiring for both fit and skill. #2 and #3: Dr. Jekyll or Mr. Hyde: Whose Resume Do You Have? CareerBuilder reports that a whopping 58 percent of hiring managers or recruiters have dealt with resume falsifications, a number that grew during the recent recession. When you add that to SHRM’s HR analysts findings that most resumes are read for five minutes or less, you have a dastardly potion brewing. Spend time getting to know your candidates personally and thoroughly vet their backgrounds to ensure you’re getting the brilliant Dr. Jekyll — not the despicable Mr. Hyde. In 2014, a Deloitte HR analysis found that 48 percent of executives lacked confidence that their human resources department was capable of meeting global workforce demands. What are you doing in the face of globalization? Depending on the location of your employees and offices, you may have a lot of education and retraining to invest in. Industry statistics and HR data shows that one in three new hires quits within the first six months. Why? Lack of training, failing to fit in, not enough teamwork. Remember that recruiting is only half the battle — ensure your structure is also set up to effectively retain new and old employees alike. Did you know that one-third of new employees decided within their first week of work whether they’ll be staying with an organization long-term? How do you welcome and onboard new employees? Ensure the first impressions you give are accurate and positive. #7 and #8: Engaged and Happy Workforce or Disengaged Automatons? Employee engagement has long been a key issue in workplace success, and recent data and analytics show that hasn’t changed. Nearly two-thirds of all employees are disengaged, and 70 percent are unhappy with their job — and that will show in their work and in your company’s success. You can never overestimate the value of a well-designed engagement strategy. Are you ready for as many as two-thirds of your workforce to leave your organization within the next year? That’s how many employees the Kelly Global Workforce Index says will actively engage in a job hunt in a year or less. Again, preventing this requires a strong employee engagement strategy paired with an attractive total rewards package. About 10,000 baby boomers turn 65 every day – and millennials now represent the largest subset of America’s workforce. Are you ready – really ready for the shift your business will undergo as a result? Insight and data show that millennials expect to be compensated differently, engage differently and work differently. It’s time to brush up on your emojis and get down with Snapchat. Don’t be scared, but do prepared! As we approach the end of the year, take these 10 scary HR stats into consideration when re-strategizing your employee engagement strategy. Don’t be kept in the dark by downloading The Greatness Gap: The State of Employee Disengagement White Paper. Also, make sure to check out our cool infographic highlighting these 10 scary HR stats!